This is my first book by this author. I know Incarceron has a huge fan base, so I was looking forward to reading something by this popular author. I enjoyed the author's writing style. I found it easy to read and more ya than mg. I thought she blended conversations and actions well (there was a good balance of both). I am, though, conflicted on this book. I spent about 3/4 of the book wondering what in the world was going on (and for some reason spent the first 1/4 of the book not knowing what time period it was.) That is my fault- I know they were sending emails and using cell phones, but I think it being set in a village with an old and creepy abbey made me think of historical fiction. Which it was... kinda. I enjoyed the tie-in of the fae in this book. I am always a huge fan of fae, but I wonder why they were there (plot-wise I get it, but I am not seeing why they were neccesary). There is no romance in this book, but I wasn't disappointed. I enjoyed the interactions between characters. I have to say, my favorite character was Wharton (Jake's teacher). I felt like he was the voice of reason and the voice of "what the heck is going on here??" voice in the book. I also don't read many books narrated by males, but I really enjoyed this one. This was a fun introduction to this author for me. I look forward to finding out more about this world (and what on earth is going on!). 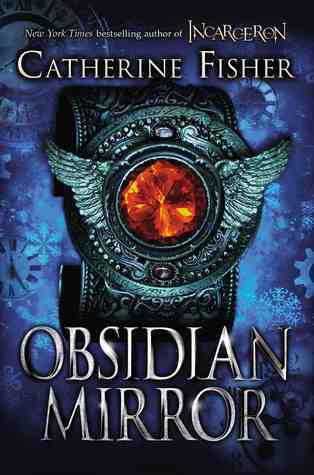 A mix of light fantasy and science fiction with a dash of history, The Obsidian Mirror was a fun and adventerous read with serious undertones. I've never read anything by this author either. The book sounds interesting, but I really don't enjoy reading books that are confusing.